When autumn nights close in and Halloween and bonfire night are just around the corner, nothing hits the spot like some warm and comforting bangers and mash. No trip to the UK is complete without at least one meal in a pub. And bangers and mash – or sausages and mash as it’s usually called these days – is standard pub grub on traditional menus. The good news is that poor quality sausages, packed with tasteless fillers and drowned in gluey gravy from a packet are definitely on the wane. In a good pub, you are much more likely to get a generous portion of three, fat, well-seasoned butcher’s or artisanal sausages on creamy mash with classic British onion gravy. So do the British really love their sausages? You’d be hard pressed in the British Isles to a find a more universally popular food – though in our diet conscious times they are more of an occasional guilty pleasure than a family staple. Still, they are eaten for breakfast, lunch and dinner (according to some sources, 44 per cent of British sausages are eaten at the evening meal). There are holidays when sausages are so traditional they are practically required. 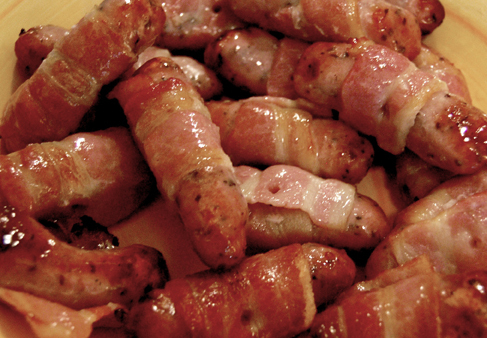 At Christmas, small ones, called chipolatas, are wrapped in bacon and arranged around the family turkey. On the 5th of November (Guy Fawkes), when the English gather around gigantic bonfires to remember the foiling of a 17th century plot to blow up Parliament, they often eat baked potatoes and sausages. At one time, they roasted them on sticks in the community bonfire themselves. Today, health and safety bureaucrats have stepped in and the fires have become much bigger and more dangerous so it’s more common to find local organizations raising funds by selling bangers cooked over a grill at Guy Fawkes fireworks displays and bonfires. Even vegetarians indulge – in meatless sausages of course. In fact, the average Brit eats about 4.5 kilos (that’s about 10 pounds) of sausages a year. According to consumer research company Kantar World Panel, 86 per cent of British households buy British bangers at least once a month. In 2014, they polished off 181,853 metric tonnes of sausages. Every day in Britain, 3.7 million meals of sausages are eaten at home. Annually, that’s an unbelievable 1.35 billion home cooked sausage meals. And there are at least 470 different sausage recipes around. Among several traditional pork sausages, the most popular are peppery Cumberland, presented in one long coil; Lincolnshire, seasoned with sea salt and so much sage the raw mixture can look green; London sausages with ginger, mace and sage and Oxford sausages that combine pork, veal and lemon with savory herbs. Boutique butchers combine pork with leek, apples, chestnuts, stilton and port, ale, chives. And lamb sausage recipes are popular, combined with mint or rosemary. Then there are the exotic sausage recipes — chicken and lemon, mango and duck, venison with smoked ham, pork and juniper berries. Glamorgan sausages, from Wales, are made with cheese and have no meat in them at all. Why are British sausages called bangers? The expression dates from World War I when food shortages meant very little meat for sausages was around. Producers filled them, instead, with scraps, cereals and water. When soldiers in the trenches cooked them, on hot shovels, they popped, snapped and sometimes exploded, thus the name bangers. Today, only the cheapest sausages are fattened up with fillers. Consumer pressure has changed all that. The skinny, shriveled-up breakfast sausages you may have grown up with, especially in the USA, bear little resemblence to the classic butcher’s sausages that are taken for granted in the UK. Whatever the filling, British sausages are thick, generous (at least an inch in diameter and sometimes an inch and a half, 4 to 5 inches long) and juicy. Two, accompanied by mashed potatoes and onion gravy (the classic bangers and mash), make a very filling, man-sized meal. About 20 per cent of all sausages eaten in the UK are eaten as part of a pub meal. If you’ve enjoyed good sausage and mash in a pub on your UK vacation, Sausages with Cider and Apples is a recipe that will bring back good memories and help you create a little taste of England at home. It’s a Lincolnshire variation on the classic bangers and mash that’s equally good with beef or pork sausages ( but not frankfurters or hot dogs). Just make sure you buy the best, fattest sausages you can find and treat them with respect. Slow browning prevents sausages from bursting and retains juices. Whether you cook your sausages in a fireproof pan or over an open grill, turn them frequently and avoid the temptation to rush. 1 large red eating apple. Prick the sausages once or twice with a fork, then lightly brown them in a medium sized cast iron or other heavy-bottomed skillet for about five minutes, turning often. The skillet should provide just enough room for ingredients to fit tightly. Pack the onions in around the sausages, giving the pan a few shakes. Stir in the mustard, thyme and apple juice. Cover and simmer (do not boil) over medium low heat for about 30 minutes. The apple juice will combine with other pan juices to make a rich gravy. Season to taste with salt and fresh ground black pepper. Core but do not peel the apple. Divide into 8 to 10 slices and arrange over the top of the dish. Cover and simmer for another five minutes. The apples should soften but keep their shape. 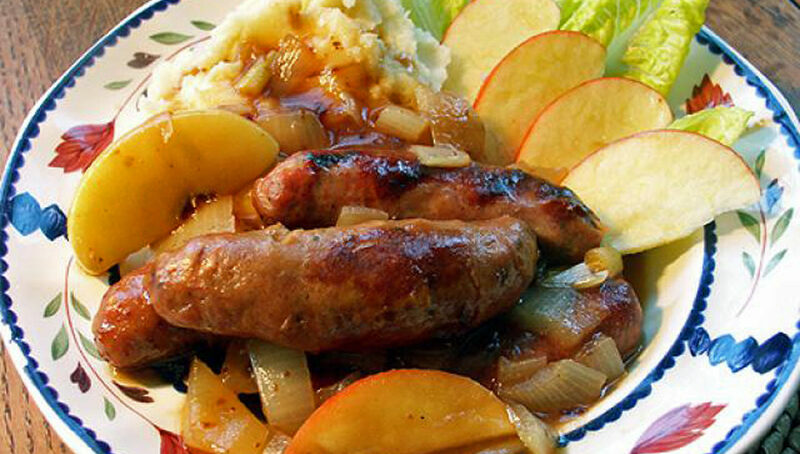 To serve, arrange two sausages on a generous portion of creamy mashed potatoes and top with apples, onions and gravy.